So when I was thinking about Ryan going into Pre-K this fall, I was thinking about little traditions I want to do for him (and later, Owen) on his first day and knew pancakes would be on the list. And, because I can’t let anything just be, I thought about taking it to the next level. Which brings us to these first day of school pancakes. 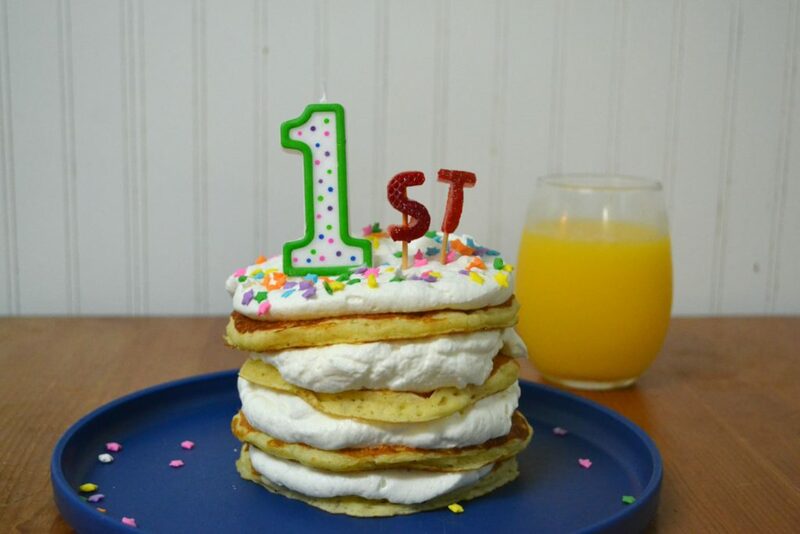 What kid doesn’t love a giant stack of pancakes layered with whipped cream and sprinkles, shining with a candle to blow out and make a wish for the upcoming school year? It’s a simple litle way to let your kids know that this is an exciting day! To get this started, you’re going to want to make your favorite pancake. I have a few on the blog – these apple cinnamon ones are fun for fall and these ricotta ones were created by a pediatrician with kids in mind – and my favorite ‘normal’ recipe is I use these. It never fails me. Before stacking, you’ll want to cool your pancakes down a bit so that you don’t totally melt the whipped cream. I just let mine sit in one layer while I made the whipped cream. For the whipped cream, I made homemade whipped cream because honestly, I don’t think there’s really anything better. It’s stupid easy – a couple tablespoons of sugar + a pint of whipping cream the bowl of your stand (or electric hand mixer or if you’re super brave and have killer arm strength, a wisk) mixer and let it go on high until your cream holds stiff-ish peaks. 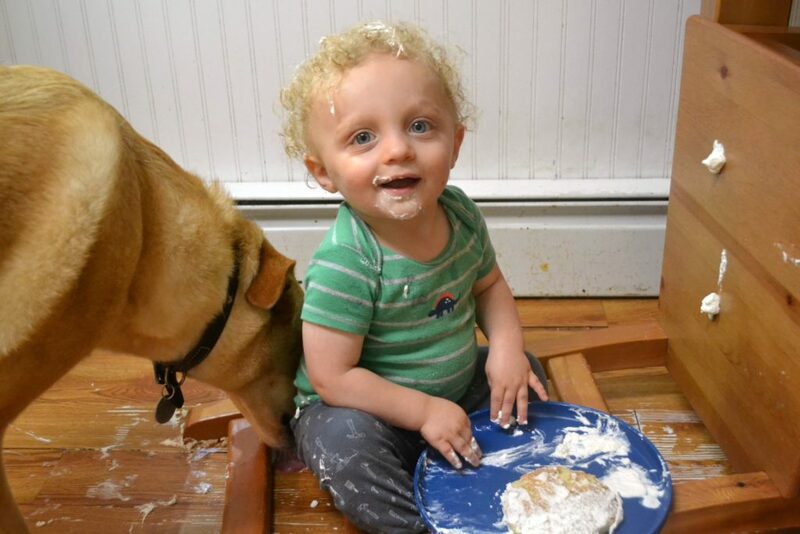 Make sure to stop when you think you might be close and just check on it – it’s a fine line between stiffly whipped cream and butter. But, you don’t want it too loose or the weight/any remaining heat will just squish it. When you’re all ready to go, layer a pancake, a large thwack of whipped cream, and then gently press another pancake on top. Repeat, alternating whipped cream and a pancake until you’ve got a nice tower. 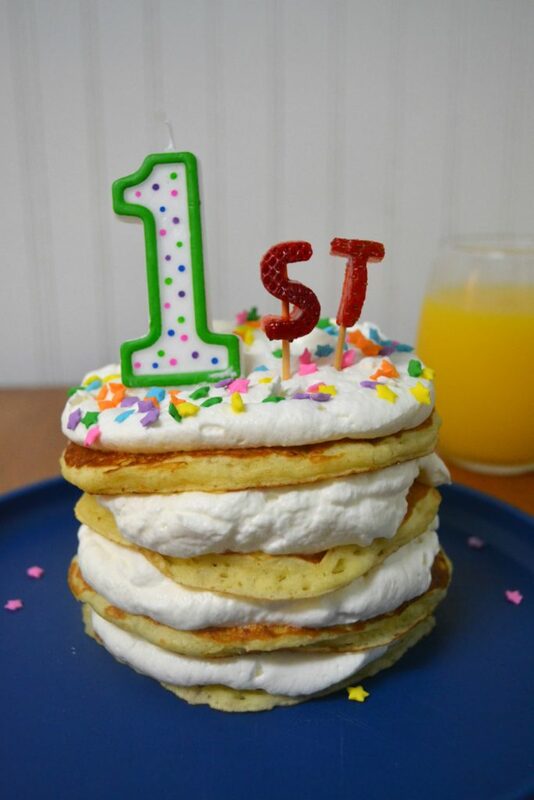 Next, take your fruit and using a small letter-shaped cookie cutter (*Amazon affiliate linkI use these) to make your letters before skewering them onto a toothpick and placing them on your pancake next to a number candle to denote grade your kiddo will be entering. (1st, 2nd, 3rd, 4th – you get the picture. Try PRE-K for preschool or a big K for kindergarten + a normal candle) Top with sprinkles, light, and serve! It’s a simple way to make the first day back to school exciting and celebrate a new year! And you don’t even have to go through that much trouble. Super quick version: In a rush in the mornings but still want to make the first day of school special? Use canned whipped cream or defrosted Cool Whip and layer with store bought frozen waffles or pancakes or frozen homemade pancakes. Every time we make pancakes, I make a double batch, lay half out on to wax paper lined cookie sheets and freeze. Once they’re frozen I toss them all into a zip top bag and then just toss them into the oven or toaster to reheat. When it’s time to serve, light the candle (which, TBH I didn’t do but I was planning on it and then got REALLY happy I didn’t when Owen upended the whole thing when I went to – you guessed it – go find a lighter, see below) and tell your little to make a wish for the school year! So there you go – an easy way to make your kiddos first day back to school a little more magical! 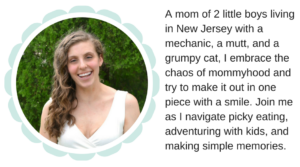 I think this would also be a super fun way to celebrate birthday mornings or even an easy smash cake for a first birthday. Okay, so tell me – what are your first day of school traditions? 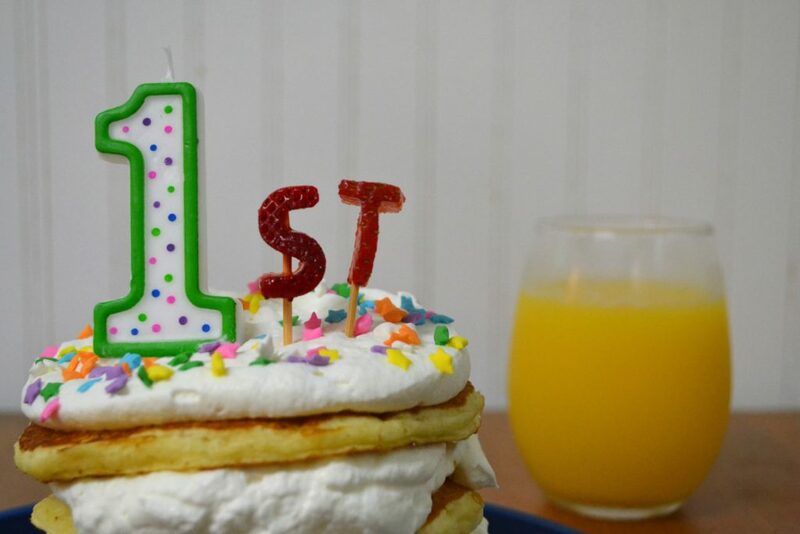 Would your kids enjoy these first day of school pancakes? Let me know in the comments!